� A big solid foot, ample bone, awesome structure, big bodied, huge topped, cool made and softness to go with his masculinity. � He�s one that won�t soon be forgotten. 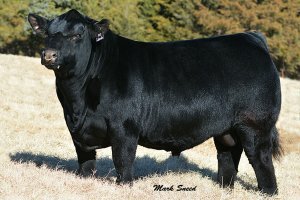 Lincoln was Champion percentage bull at the 2013 Simmental Sweepstakes. He has the maternal aspects of Myer, Ebony Antoinette, Black Jade, Joker and New Edition and the Dream On far enough back in the pedigree that he can be used on those hard to mate Dream On daughters. He�s the kind to leave an impression set in stone!